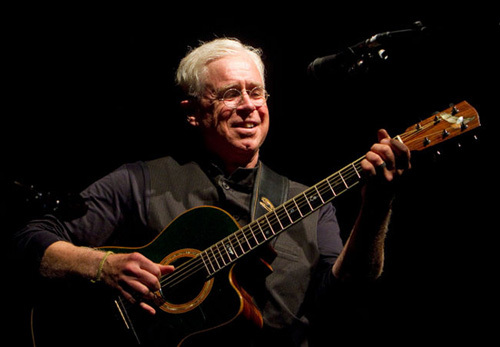 14 February 2014 - When Bruce Cockburn steps onto the stage at the Grand Theatre next weekend, it will be a homecoming of sorts. When Bruce Cockburn steps onto the stage at the Grand Theatre next weekend, it will be a homecoming of sorts. The Canadian music legend -- responsible for such classic songs as Wondering Where the Lions Are, Lovers in a Dangerous Time and If I Had A Rocket Launcher -- lived for a number of years in a house he owns just to the east of Kingston before moving south about four years ago. "I miss the house, and I miss the whole feel of that part of the world," the 13-time Juno Award winner said over the phone from San Francisco, where he has since settled with his wife and two-year-old daughter. "It's kind of what I grew up with. My sense of nature, my visual image of nature, involves pine trees and rocks and, you know, all the stuff that you see in that area, the Canadian Shield." Kingston is the last stop on his Canadian tour, so he hopes to have the chance to spend at least a little bit of time in this area before heading back to California. Cockburn -- who received an honorary doctorate in divinity from Queen's University in 2007 -- isn't touring in support of a new album, as is often the case. His last recording, Small Source of Comfort, was released in 2011. His latest project, in a way, is the documentary titled Pacing the Cage [DVD], which was released this past summer. It follows Cockburn on the road, during which he reflects on his life as a musician, on his spirituality, and on his activism. The "activism" segment of the documentary offers some familiar sights to Kingston residents, as it chronicles, among other things, Cockburn's involvement in a fundraising concert for Queen's University professor Bob Lovelace, who was jailed in 2008 for opposing the mining of uranium north of Kingston. "I recall it being a pretty good night," Cockburn said of that concert at Sydenham Street United Church. While Cockburn is often viewed as an activist, he feels it's simply an offshoot of the songs he writes. "I find myself in a situation that produces a song about a certain issue and then I get asked about it in interviews and then suddenly I'm an activist," he said over the garbled cellphone connection. "On top of that, there have been many occasions where I've been asked by the people who are the real activists, the people in the (non-governmental organization) community or others, who are working on something and have asked if I would stand up on their behalf, and I've done that because it was a good thing to do. But those are the real activists." Late last month, protest singer Pete Seeger passed away at age 94, and Cockburn was among those who performed at Seeger's 90th birthday party. Cockburn and Seeger had performed together as recently as last December at a benefit for Native American activist Leonard Peltier. "I did some notable gigs with him over the years," he noted. While other folk artists were greatly influenced by Seeger, Cockburn wasn't one of them. Seeger was more of an "indirect influence," he said. "I was aware of (Pete Seeger), and he certainly was a positive presence for me at an early age," Cockburn said. "The teacher I had in Grade 3, I think, told us about him. We were doing a show and tell at the beginning of class -- you bring in a newspaper clipping and read it and people talk about it -- and so someone, I don't think it was me, brought in a clipping about the McCarthy trial, the Senate investigation into communism. The teacher mentioned Pete Seeger and what a hero he was for resisting it." While Cockburn, who became a member of the Canadian Music Hall of Fame in 2001, is still putting together the set list for his short Canadian tour, one thing's for sure: he won't be playing any brand-new material. Cockburn's time these days is occupied penning his autobiography, which is due out in the fall. "The book is taking up all of my creative energy at the moment," the 68-year-old noted. "I haven't even thought about writing songs for a couple of years now because of the book." While approached many times by writers wanting to write his biography, it was always, Cockburn felt, too soon. Plus, he wanted to write it himself. And then publishing house Harper Collins came along with an interesting proposal. "We'd like you to write a spiritual memoir," they told him. "Well, what's a spiritual memoir?" he asked. "Well, we don't really know, but we'd like you to write one," was the response. He believes the publishers were keen on the idea after reading about him in William Young's Christian-themed novel The Shack, which sold 18 million copies. In it, Cockburn is mentioned as being a favourite of God's (and definitely Young's). For the book and he brought in a friend [Greg King] to help him co-write it. When: Saturday, Feb. 22, at 7:30 p.m. Cost: $59.50 and $49.50, plus handling fees and taxes. For more: kingstongrand.ca for tickets, brucecockburn.com for the tour dates and the like.